Launched at Grand Designs 2014, the incredible Mini Cooper Pool Table is available in either a brand new metal Heritage body shell, or a fibreglass replica. For those of you seeking something new and different from a pool table, in a style that will immediately catch everyone's eye and set them talking, look no further than our Mini Cooper Pool Table. This incredible car pool table is made by Kent-based manufacturer Chisel Pool, and Home Leisure Direct are the exclusive retail partner for the UK, Europe and Worldwide sales. Chisel Pool take iconic cars and use them as the basis for incredible pool table designs, including the astonishing Mini Cooper. The Mini Cooper has been built in two different forms: fibreglass and metal. The metal body is more expensive but provides a true Mini Cooper experience, whereas the fibreglass body is cheaper and removes any danger of rust no matter the environment in which it is stored. The prototype car underwent an extensive development process to achieve the finished article. The donor car was a 1984 Mini “City”. Everything not needed - the engine, roof, suspension, floorpan, all wiring and brake lines - were stripped out, and then a patent-pending space frame chassis was designed and built to be able to support the whole car as well as the pool table playing surface. While currently painted in a classic red, it can be re-sprayed to any colour you desire. 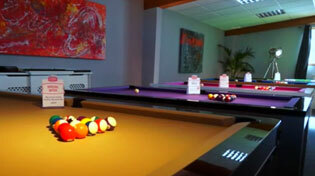 Chisel Pool's car pool tables are completely customisable, from the playing surface down to the wheels. We can custom build a pool table into virtually any car - you can provide the donor vehicle or we can source it for you. Call one of our experts now on 0800 622 6464 or 01454 413636 if you would like more information. Customisation options on car pool tables are pretty much limitless. Firstly, you can choose any car you want, and either supply it yourself or get our experts to source it for you. If you've got an old car that you just can't bring yourself to sell or scrap, why not turn it into a pool table and get years of enjoyment from it in a different way? Further options include a myriad of customisation changes that can be made, including the paint colour, decals, a drinks cabinet in the boot or bonnet, a sound system, honking horn and flashing lights when a ball is potted, or anything else you can think of. A ball return can even be installed to send potted balls to the boot. Even the pool table element itself is fully customisable. The fibreglass model has been fitted with the pool surface from a Supreme Winner, while the metal version features the slate and cushions from a Sam Atlantic English pool table. Of course, our experts will always be on hand to advise on the best surface and cloth for your needs, as well as finding the right components to fit your chosen car. If you would like to enquire about a car pool table, whether the Mini we already have or a brand new project, you can call us free on 0800 622 6464 and speak to a member of our expert team who will be able to answer any questions you might have.